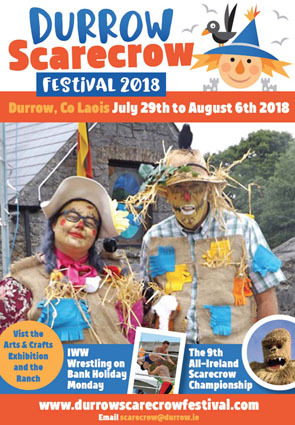 For the festival, there is extra parking in front of the Scarecrow Village for those who require assistance and if there’s space a steward will remove the barrier for you. It’s busier at the weekend so just to be aware of that. We also facilitate drop off and pick up so make sure and let a steward know you require parking or assistance. One side of our village is wheelchair friendly as it’s been regenerated with the assistance of a wheelchair using family. The Kilkenny Road in the Village (Mary Street and Carrigean Street) are narrow and unfortunately if cars park on footpaths it’s very frustrating for everybody. There are however lots of areas that are easily accessible for both wheelchairs and push chairs.